I come back to D3 about once every 6 months, and every single time I’ve forgotten how joins work. To avoid that next time, I’m writing it down to explain to myself, and hopefully you might find it useful too. This pattern will work for all circumstances, so I plan to stick to it in future. At that point, the selection may be empty – a static visualization for example, would not have any previous elements created, or if you are updating an existing container, there may already be some items you want to retain, but perhaps update. Knowing what to do when you update that with new data is the thing that many have trouble with. Let’s walk through how to do it. Let’s visualize this data as a series of rectangles with the name in the center. Later on we’ll be changing the names, taking some away and adding others. The first step is to do the things that you’ll only want to do once. This selects a parent element to hold the visualization, and appends an svg element of a given width and height. This element will be accessed by the variable “selection” in future. We only have to do this once, so I’ve moved it to its own function that will be called at the beginning of the app. Here’s what selection looks like at this stage. 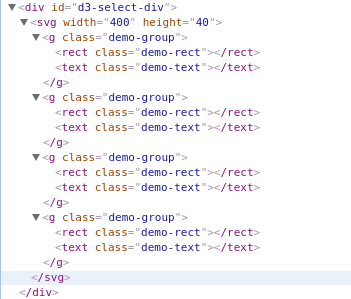 It has one item – an svg element. Occasionally you need to do a bit of data preparation, as it’s handy to carry around index information with each item, so the first step when receiving new data is generally to fiddle with it. Here I’m simply adding an index number to each item. Assigning the data to the selection does the join magic. Notice that the selection now contains _enter and _exit properties. _enter contains the data that it’s seeing for the first time, and _exit would contain any surplus items (if the data just received was smaller than the last time). This is the most important join concept, and although it seems simple, the mechanics of dealing with it are what usually trip people up. In this case, since it’s the first time called, there are no items to exit – but when future data arrives, there may well be. Notice that the _enter property contains 4 items – one for each data item. We now need to “accept” them and create 4 new svg groups. 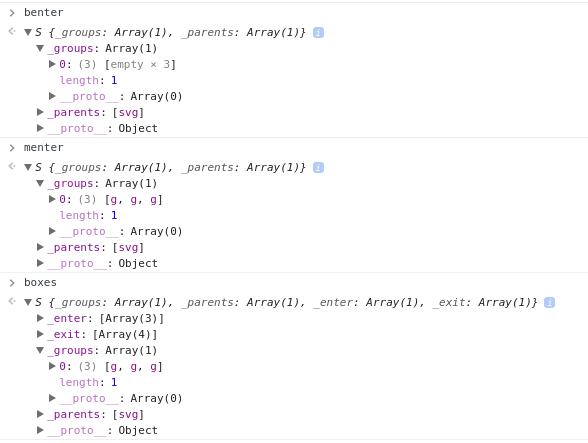 Adding a class to each of the groups will enable them to be found again (look back at how the initial select was done by looking for items with this class). The result of the enter method will be the 4 groups that were added. These groups will become the parents of a rectangle and text for each item. Note that although the text seems to be “in” the rectangle, only groups can be parents, so the rectangle and text are actually siblings – both children of a group. At this stage these have no attributes. If there was any special attributes that would be set for new items (as opposed to updating existing ones), then this would be the place to chain them. The only attributes I’ve added is to assign a class to each of these so they can be found later. The markup is now filled out out to it’s final shape. Since I want to apply updated attributes to both new and updated items, I can now merge the newly entered items, with any that were already there (this is the step I always forgot to do when starting with D3). This is called an accessor function and is called for each data item. You simply return the value to be used for that attribute for that specific data item. Here’s a test updating the visualization with different data after waiting a bit. This time, the second time it runs we should see an exit, as “pete” goes away. Notice that _exit still contains 4 items, 3 of which are empty. .remove() will remove the non empty items (in other words the 4th one that used to contain “pete”, and _enter contains 3 items, all of which are empty (which means it won’t attempt to enter any new items). This time, “benter” has no items to process, but when merged with the groups from “boxes” we now correctly have 3 items to update. // because so far all we've done is add new items.